I know baked potatoes aren’t something that most people would normally rave over, but I can’t find it in myself not to rave over these twice baked cheese & chive potatoes. I mean, really, who doesn’t like a baked potato? 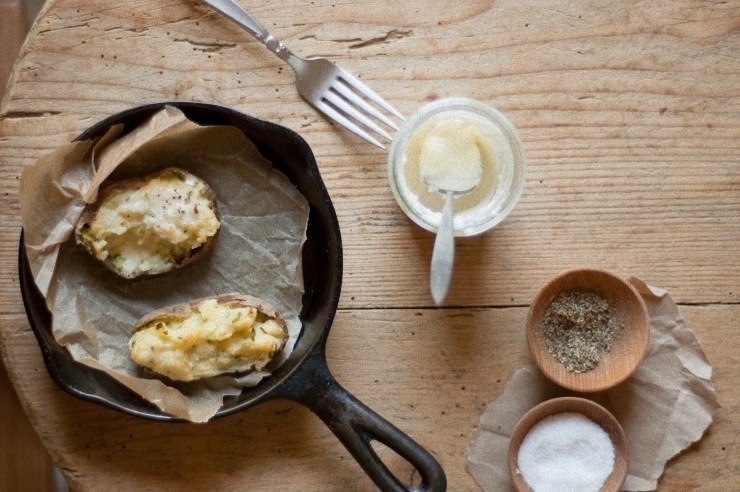 These aren’t your normal baked potato filled with cheese, salt, pepper, and (dare I say?) a liberal amount of ketchup. When I last made these potatoes, they were all part of a simple meal that went with this roasted chicken. We called the chicken, a simple salad, fresh bread, and these gloriously sophisticated potatoes, dinner. Although I did mention that they are a bit revved-up from your normal twice baked potatoes, I am not stressing that these are entirely sophisticated because in all actuality, my version tastes almost like those ruffled potato chips with cheddar and sour cream that you are secretly obsessed with (okay, maybe it’s just me). I grew up eating baked potatoes; we never had them the same way twice, and because of that, I’m sure that I can sit here and list hundreds of ways to serve baked potatoes, but honestly- I feel that these are my favorite way to have them. Potatoes are scrubbed and washed, then thrown directly on the oven rack to bake at 375 degrees fahrenheit for about an hour and a half until the skins are golden brown and crisp on the outside, and they give a little when they are gently squeezed. Once the spuds are out of the oven, they are immediately split in half, and the fluffy flesh is scooped from each of the halves into a large bowl. In the bowl, a huge dollop of crème fraîche is added to the potatoes along with a snowfall of freshly grated Parmesan, Pecorino Romano, and Gruyère cheeses, sea salt and pepper, and a good handful of chopped chives. A lightly beaten egg is mixed in, which will help transform the pale verde-freckled mixture into a beautifully tanned and crisp filling, while they are in the oven. The potato skins are then stuffed with the fluffy cheese and potato mixture, and is bunged back in the oven until they are faintly blushing with bronze and the filling is slightly crispy. If you’re roasting this chicken and making these potatoes, both things will be done around the same time, which I find to be quite convenient. If no one’s in the kitchen, I’d hide a couple for midnight snacking because they definitely will not stand a chance at the kitchen table. Thank me later. These twice baked potatoes are very versatile. If you don’t have crème fraîche, simply use sour cream, instead; I suspect yogurt might work well, too. Just add a couple tablespoons or so of butter if you’re using either sour cream or yogurt. I added around 3 ½ ounces (100g) of cheese to the potato filling; I didn’t want the cheeses to be too over-powering, but feel free to add up to 7 ounces (200g) of whatever cheese(s) you decide to use. Parmigiano-Reggiano, Goats’ Cheese, Mozzarella, Cheddar, Stilton / any blue cheese (maybe use Rosemary or an other herb, instead?) are just a handful of types that would work well. The possibilities are endless. If you’re short on patience or time, you can “bake” the potatoes in the microwave (I think around ten minutes will do; be sure to poke them with the tines of a fork- you don’t want exploding potatoes), then finish them off in the oven. Preheat the oven to 375F/ 190C/ Gas Mark 5. Place the potatoes directly on a sheet of aluminum foil directly on the wire rack of the oven. Bake for 1 ½ – 1 ¾ hours until the skins are golden brown and crisp on the outside, and they give a little when they are gently squeezed. 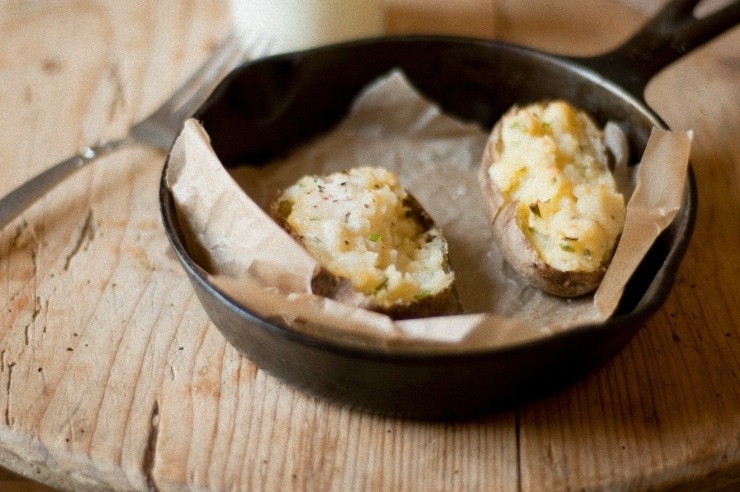 Take the spuds out of the oven, and using a clean tea towel, split each in half. Scoop the fluffy flesh into a large bowl. Dollop in the crème fraîche, chives, and cheese. Season with salt & pepper to taste, then stir in the beaten egg. Spoon the potato mixture back into the skins. Put on a baking tray in the oven for about 18 minutes, or until the herb-freckled mixture is beautifully tanned and slightly crisp on top. Serve with dollops of crème fraîche, salt & pepper. Enjoy! Note: Will keep for up to 2 days in the refrigerator in a covered container. I recently met someone who very casually said “I hate potatoes”. I’m still trying to understand what sort of a person doesn’t like potatoes. Definitely someone un-Irish. And un-Desi. And un… oh well. Sorry, arbit rant there. But these do look delicious. My goodness these look divine! I will definitely be trying this recipe; thanks for sharing! These look fantastic! I’ve never had a twice baked potato and I don’t think I’ll try this until this summer heat is over with (twice baking in a tiny kitchen in summer with no a/c seems like a death wish). I’m bookmarking these for sure – and I know what you speak of about your potato chip addiction. Mmmm. Yummm…potatoes never looked so good. I haven’t had a baked potato in quite a while and this must change very soon. Rave away, I’m a big fan of baked potatoes! This looks awesome. Twice baked potatoes are so good! Now this is baked taters done right! They look amazing Kamran. gotta go buy some spuds now…. Sound great, but I am just not feeling the ketchup. Well, it’s not in the recipe. And honestly this recipe with ketchup wouldn’t be tasty to me. In an other recipe- yes. Twice baked potatoes are so retro. And I love retro food. And, the possibilities are endless. You could add in some crisp pancetta. (Fancy for Italian bacon). But how good with these be with some crushed potato chips put on before you put them in oven. (the kind you like). love to put a gravy on top of this.. These potatoes look awesome!! Thanks for the great recipe. Hi Kamran, could you recommend a variety of “baking potatoes”? I’m going to make these today but I want to make sure I get the right type of potatoes from the store. Thanks! Hi Lizzy- If you’re located in the US, a couple varieties of baking potatoes would be Idaho, Russet (I used these), Norkota, and Long White. If you’re in the UK, a couple varieties would be Cara, Estima, Marfona, and Golden Wonder. I’d just read the bag at the grocery store to see if they are recommended for baking; if you decide to get them from the farmers’ market, just ask the farmer if s/he would recommend them for baking. Twice baked potatoes so simple. So delicious. And so true about hiding some for midnight snacking! Great photos Kamran. Enjoyed your post. Made these straight after reading your post! I used a combination of bergamot and chives with greek yogurt (no sour cream in the house) which turned out fabulously! I ate it with a date-tamarind chutney/sauce to accompany, which may seem weird, but tastes divine – thanks for the recipe. I’m obsessed with potatoes and don’t need to think twice to make these ones. Thanks for posting this Kamran! Oh, these look amazing! Definitely saving this recipe for colder weather… If I throw in a green salad, I can call it dinner, right? Honestly, I did that with the leftovers the next day and called that lunch. So good. 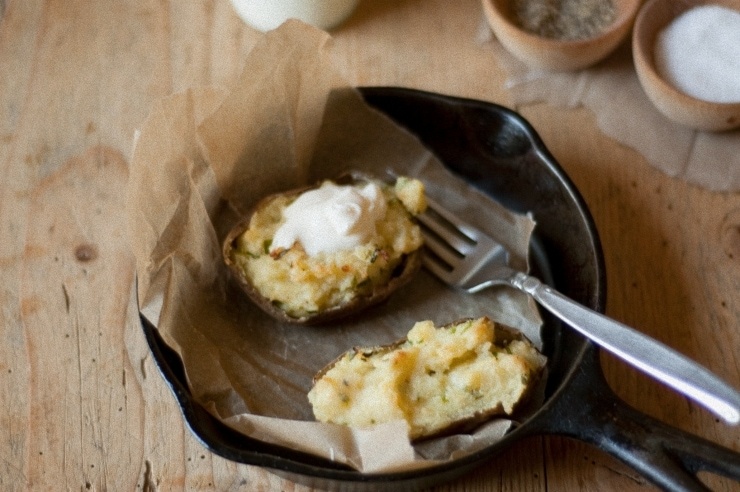 I love baked potatoes, last Sunday I use cream cheese and a dash of pepper and it is a heat…and this is another hit for my kids love the photos. The food that you cook, Kam, is the stuff I grew up on. Roasted chicken, baked potato. Reading your blog reminds me of my childhood. Thank you. Kamran u should know how I loved your previous chicken post. One of the best pieces I read recently. And then this recipe. I would totally be your guest (uninvited) to such a dinner. And I’ll be your partner in crime for midnight snacking as well. I can be totally forceful when it comes to food. Find help. Oh dear me… those look fantastic. A “snowfall” of all those beautiful cheeses. Yum. I love how vivid your writing is. And it helps that these potatoes look scrumptious. I’ve never made twice baked potatoes–I don’t know why because I adore/am obsessed with potatoes–but I will have to change that asap. 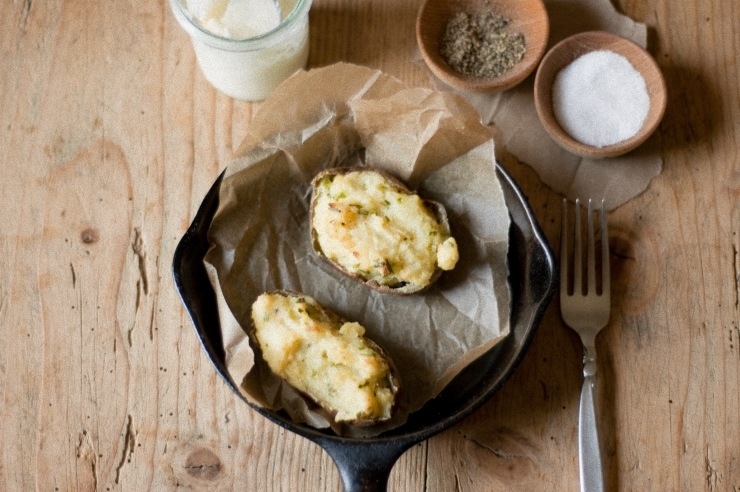 So in all the ways you’ve made twice baked potatoes, have you always used baking potatoes? Im sure the starch helps with this application but I’m obsessed with a few varieties of boiling potatoes and I wonder if I could get away with using one of those? Hi Russell- Thanks for the kind words! For this recipe, I insist that you use baking potatoes (I listed a few varieties in one of the comments above). I’m only saying so because baking potatoes are starchy, as you said, and the flesh ends up being light and velvety when cooked. Baking potatoes are another breed, per sé. They’ve thin, waxy skins , are low in starch, and mashing them will only leave you with a chunky mess because they’re made for recipes that require them to keep their shape. 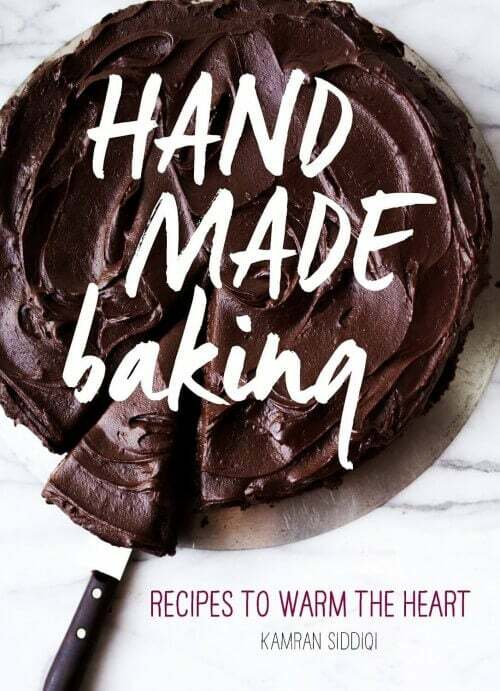 If you insist on using a baking variety- Superior, Yukon Gold, and Kennebec potatoes might work, as they’re pretty versatile, but I’d really stick to a baking variety for this one. I hope that helps! This sounds great! But you really should try some Himalayan pink salt. I get mine from Sustainable Sourcing. The flavor is so much better than regular salt! Thanks…I needed something for supper–this fits!! Hi Deb. I’ve a stash of Himalayan Salt, and I’m sure these would be divine with a sprinkling of it, but I try to avoid using overly-pretentious or just plain ol’ expensive ingredients when sharing recipes on this site. I think when people come to my site, they’re looking for simple, sophisticated, and homemade-looking recipes- not Michelin Star restaurant food finished with $30 salt. I do have expensive salts in our cupboards, and it’s nice to finish a special meal with them, but I don’t insist that everyone go out and spend that kind of money. I think good money should be spent on other ingredients. Very delicious recipe, it looks simple but it’s not, it’s a recipe worth trying. I love classic baked potatoes, but had to learn to like them. twice baked, like yours, probably helped that. They’re so decadent with all that cheesy yumminess :) Love the photos as always! These look delicious and easy – I can’t wait to try them! Thanks or answering my question! 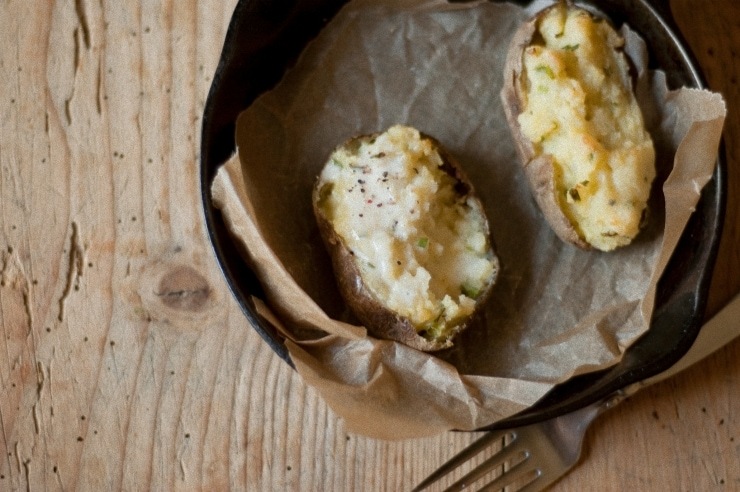 I’m trying this recipe tonight with dinner–when my mom mentioned twice baked potatoes earlier I hopped up and exclaimed, “the sophisticated gourmet boy has a recipe!” I can’t wait to dig in to them. Thanks again, Kamran. I think these look divine… and my entire family would devour this dish as well, which is a plus! I personally really enjoy raving over things people would consider uninteresting. I love cheese and starches so these sound fantastic and chives make everything better. These potatoes look great! Twice baked are my favorite kind. Plus not to mention the addition of cheese and chives…yum! Oh my lawsy! I made these for lunch. Soooo good, Kamran! I loved these with my fire engine beef chilli tonight!